Join us in congratulating Xiaowei Zhuang! 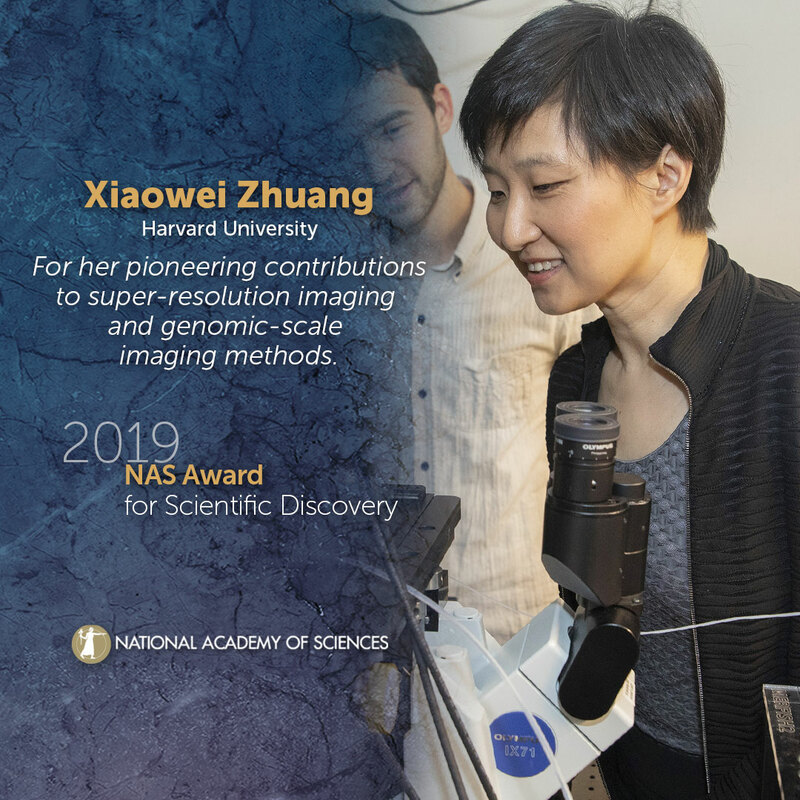 Zhuang pioneered the development of super-resolution microscopy through her invention of Stochastic Optical Reconstruction Microscopy (STORM), which was reported in 2006. The technology overcomes the diffraction limit of resolution of traditional light microscopes and is capable of creating images of cells and tissues with nanometer-scale resolution. It quickly became one of the most widely used super-resolution imaging methods. She followed this discovery with additional breakthroughs, including using STORM to achieve three-dimensional super-resolution imaging in 2008 and molecular-scale resolution imaging in 2012. In addition to the development of the technology itself, Zhuang has employed STORM to make groundbreaking discoveries of novel cellular structures. She discovered the periodic membrane skeleton structure in neurons, provided new insights into the molecular organization of synapses in the brain, and revealed novel chromatin structures important for gene regulation. Recently, she has taken molecular imaging to the genomic scale by inventing Multiplexed Error-Robust Fluorescence In Situ Hybridization (MERFISH), which has enabled the mapping of the spatial organization of the transcriptome and genome inside cells as well as the mapping of distinct cell types in complex tissues. Collectively, Zhuang’s technologies and discoveries have served to transform biomedical research. The NAS Award for Scientific Discovery is presented every two years to recognize an accomplishment or discovery in basic research, achieved within the previous five years, that is expected to have a significant impact on one or more of the following fields: astronomy, biochemistry, biophysics, chemistry, materials science, or physics through the selection of recipients of the Award. Endowed in 2014 in honor of John P. Schaefer through a gift from Research Corporation for Science Advancement (RCSA) and the Frederick Gardner Cottrell Foundation. This award is presented with a medal, a $50,000 prize, and $50,000 to support the recipient’s research. Please use the following sample social media posts and other materials to congratulate Xiaowei Zhuang.